Ok, I must admit, I’m not a holiday recipe kind of food blogger. I don’t feature holiday recipes months before the holidays, unless it’s a recipe that can be used for any occasion, like this salad. I’m honestly not an expert when it comes to cooking turkey or stuffing. I make the same stuffing every year (sausage and chestnut stuffing) and John cooks the turkey, as cooking large birds sort of scare me. I also figure that most of you have family favorite Thanksgiving recipes that have been passed down through the generations. We actually have a family favorite cranberry sauce that John’s mom passed down to us, which John makes every year for Thanksgiving. I do think that this kale salad, while being perfect for any occasion, would be a nice addition to any Thanksgiving plate. It’s chock full of color, so it would definitely liven up the all the browns, whites and tans that Thanksgiving dinner fare is known for. It’s amazingly delicious with the caramelized roasted squash paired with the toasted almonds and the aged cheddar. The flavors mesh together so well and make every bite scrumptious. The dressing is so simple, all you need is a bit of olive oil and lemon juice. Now, how easy is that? Not a fan of squash or to lazy to roast some up, no problem. You could substitute the squash for some apple or pair slices, as well as persimmon, fresh apricots, dried cherries and pomegranates. I think I might just try this salad out on my kids with some apple slices and pomegranates. They are not big squash fans, so maybe those two fruits will entice them. I thought I would share a cool fact with you that might make you feel less guilty about topping your kale salads with all that cheese. I recently read that you should have a bit of citrus (lemon juice) with your greens, as citrus helps with absorption of the nutrients. It’s also really important to have some fat in there from the dressing, nuts, or cheeses (or in this case, all of the above) to promote absorption. That certainly makes me feel better about throwing a bunch of cheese into my salad. If you are looking to serve this up for a dinner party, then I would double the recipe. It serves two people beautifully for lunch and four as a side dish. 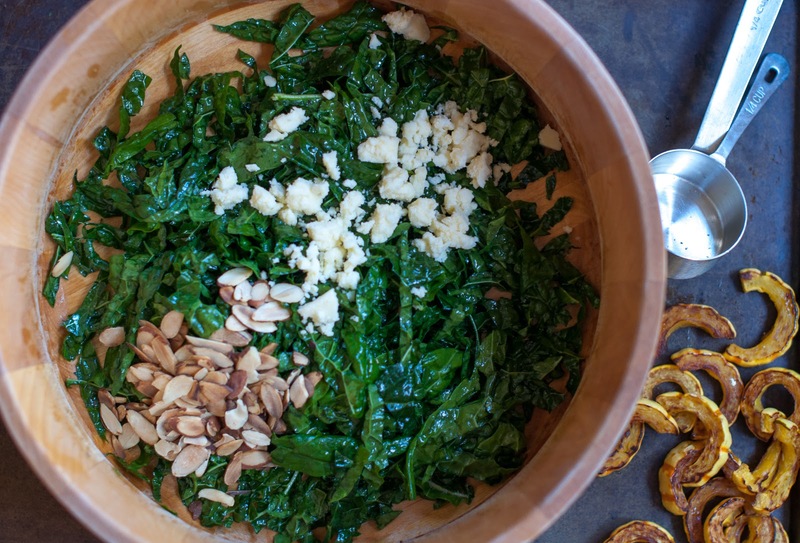 As with any kale salad on my blog, this salad is a great make-ahead salad for company or tomorrow’s lunch. 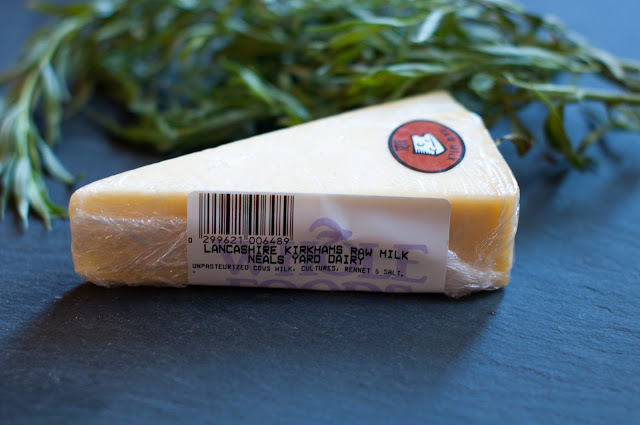 1/4 cup crumbled or finely chopped Cabot clothbound cheddar (or any good, aged cheddar) – My market did not have any clothbound cheddar, so I asked the cheese guy and he suggested one (shown below) that was AMAZING! The cheddar really makes this salad, so ask your local cheese monger what would be the best substitute for the Cabot cheddar. In a pinch and can’t find a good aged cheddar, then you can use Parmesan cheese. 3 tablespoons extra virgin olive oil, divided – You will use 2-tablespoons for the dressing and 1-tablespoon to roast the squash. For those of you that are local, here is the cheese that I used from Whole Foods. When I asked the cheese guy for a Cabot clothbound cheddar, he recommended this one below. 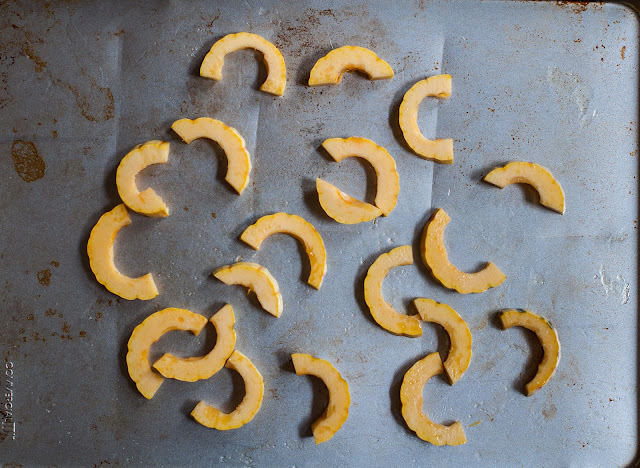 Pre-heat your oven to 425 degrees to roast up the squash. Prep all of you ingredients. 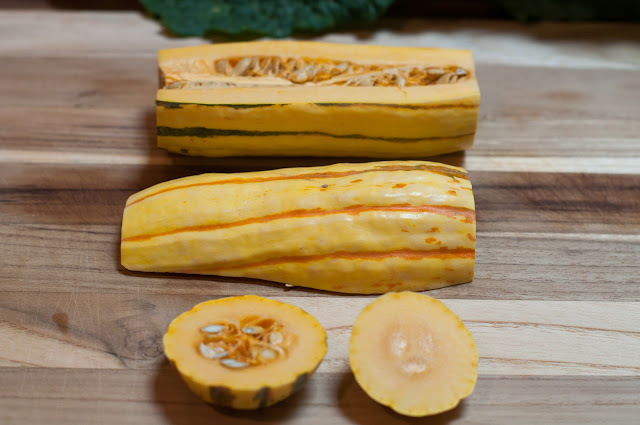 Wash and scrub up your squash, (see instructions below) wash, de-stem and slice up your kale, squeeze your fresh lemon juice. 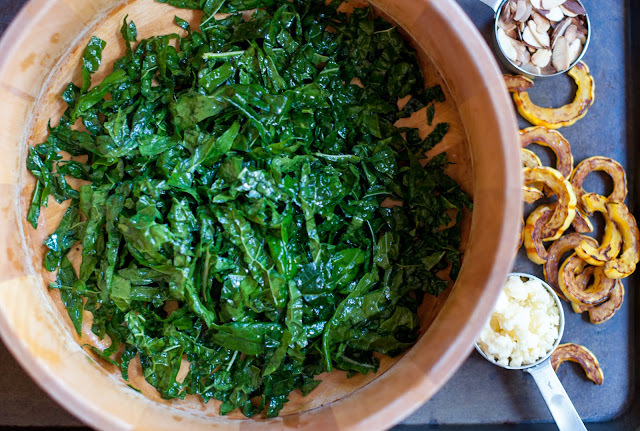 You can click here to see how to de-stem and slice kale. Toast up your sliced almonds. 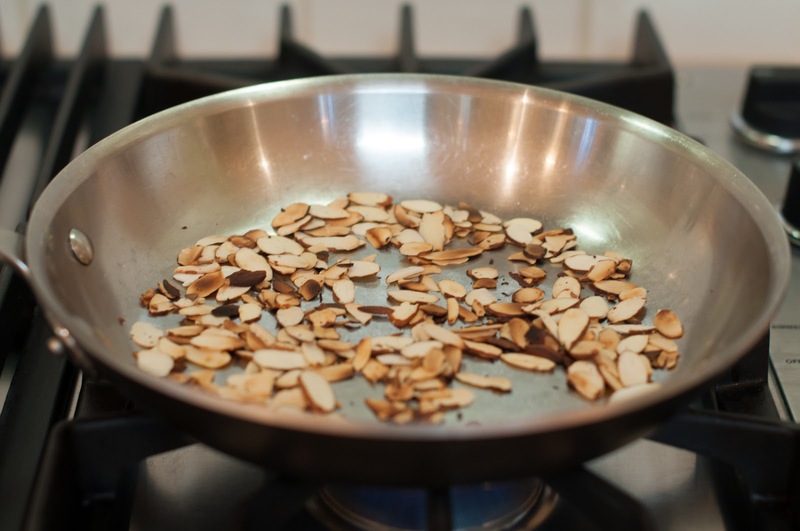 I tend to have toasted almonds on hand, as I use them in a lot of dishes. You can toast a bunch up and use what you need for a particular recipe and reserve the rest in a glass jar. They are also great as a snack. To toast them, just put some sliced raw almonds in a skillet and swirl them around in the pan (over medium heat) for a few minutes until they become golden brown in color. Reserve them to the side. 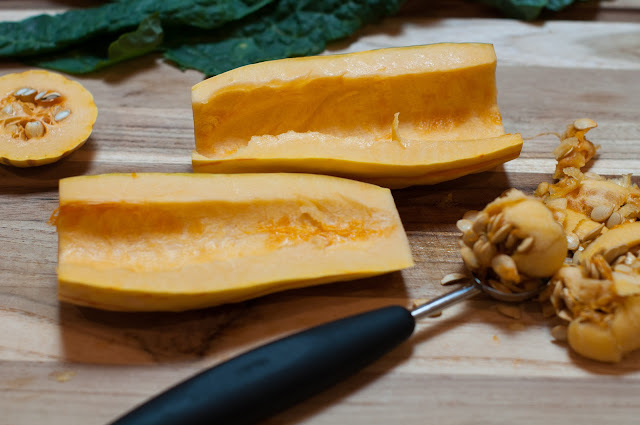 Rinse your squash and scrub away any dirt with your hands. If there are any hard spots on the squash, you can scrape them off with a butter knife. With a spoon or melon baller, scoop out the seeds and any gunk attached to them. You can discard the seeds or roast them up. Place the halves cut-size down on a cutting board and cut each half into 1/2 inch segments. Arrange the pieces in a single layer on a rimmed baking sheet and toss to coat with 1-tablespoon of olive oil and a pinch of salt. 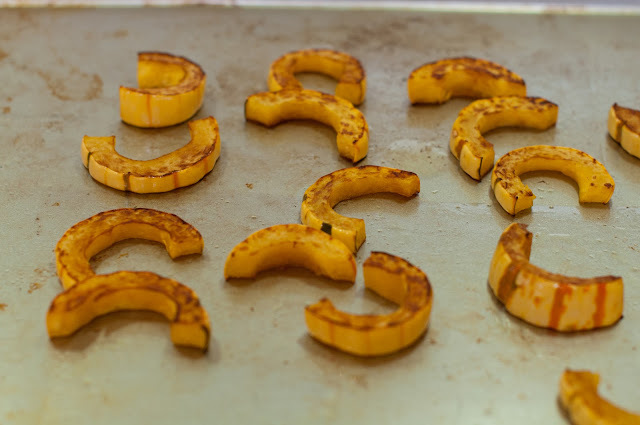 Place the squash in the oven and roast for about 7-10 minutes. Check them at 7 minutes to see if they are browned on the bottom. If they’re not, then leave them in for a few more minutes until they are brown and golden on the bottom (mine were perfectly browned after 10 minutes). When they are browned on the bottom, flip them over gently using a spatula or tongs so that the other side can brown up. Continue roasting for about 7 more minutes and give them another check. 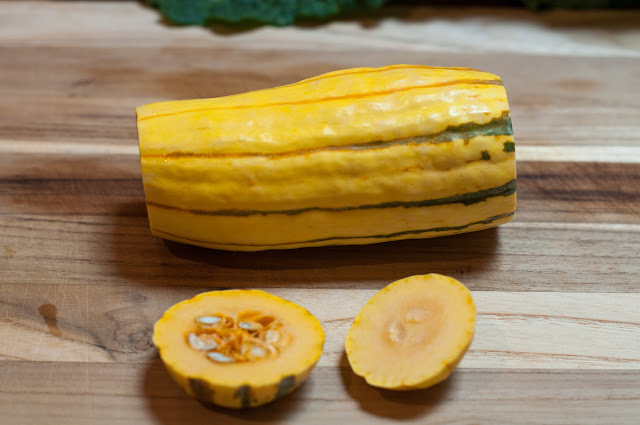 You want both sides of the squash to be golden brown and the texture to be tender and soft (but not mushy) when pierced with a fork. Mine took exactly 17 minutes to roast, but I have read recipes where it can take up to 20-25 minutes to roast. Now it’s time to put the salad together. In a large salad bowl, add your kale and 1 tablespoon fresh lemon juice and 2 tablespoons extra-virgin olive oil. Massage the dressing into the kale. Add in the toasted almonds, crumbled cheddar and the squash. Toss well to coat. You can add some fresh pepper, if you desire. 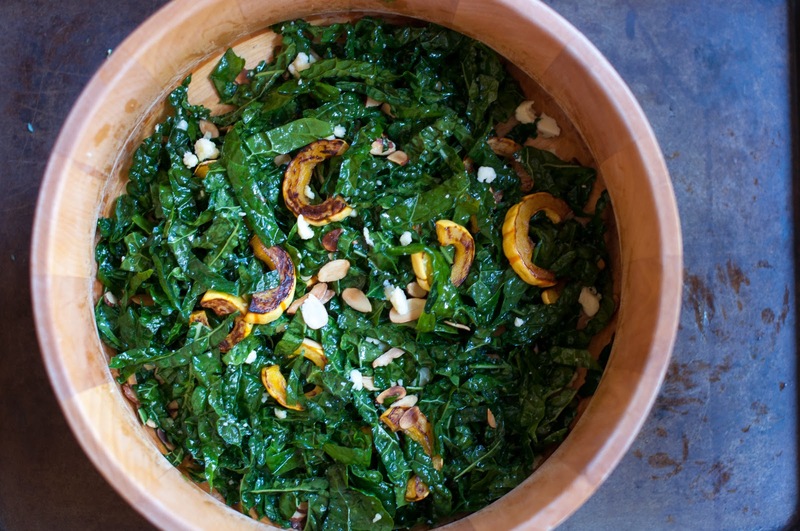 This salad pairs beautifully with a nice fall or winter soup. It would also taste great as a main course paired with a popover, some couscous cakes or quinoa patties. 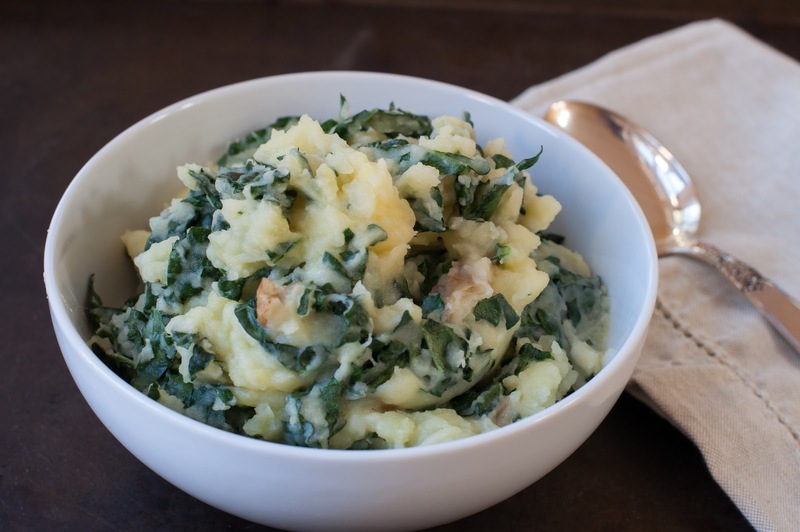 Stay tuned Sunday for these kale mashed potatoes. They’re the perfect compliment to any fall or winter dinner, as well as a healthier side for Thanksgiving. 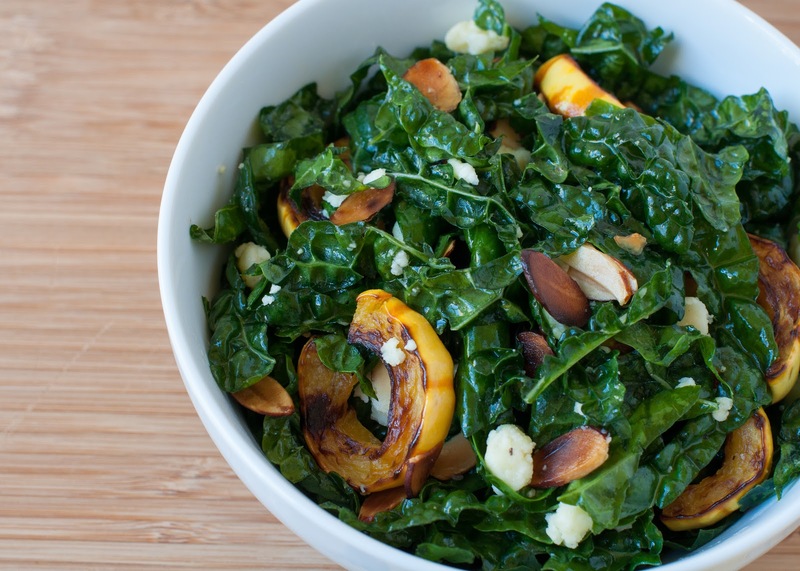 I love your Kale salad recipes – I riffed on an earlier version and make it every week! So delicious. This one looks super tasty and came up on a search of Cabot Clothbound which I am photographing for an upcoming project. If you ever need any cheese info or advice, please reach out. I love what you do and am always eager to share the joys of great cheese. If you are looking for other great clothbound cheddars, look for: Montgomery’s or Keen’s (traditional English versions), Blue Mont Dairy Clothbound (from Wisconsin), Fiscalini Clothbound (from California) or Beecher’s Flagship Reserve (from Washington). All truly great cheeses. This sounds delicious! I knew I’d eventually find something to do with those delicatas I bought awhile ago and I have tons of dino kale in my Tower Garden right now–yay and thank you so much!! HI Marina! I can’t wait to try your kale salad with the avocado dressing! SO glad you liked it with the parm and apples. Try that cheddar that I listed from Whole Foods if you get a chance. Next time I buy it, I will drop some off to your house so you can try it. Oh wow, this looks fantastic! I can’t believe I have never tried kale before! I must try it out soon! Hi Cathleen. If you’re new to kale then you have to try my lacinato kale salad. The recipe is the top one under most popular recipes. It has turned kale haters into kale lovers. I appreciate the non-holiday recipes…after all, we still have to eat, the other 363 days a year! I love the way you’ve cooked the squash, I’ve been meaning to try it, thanks! I’m there with you Sue. Thanksgiving fare has never been my favorite. All the work that goes into a meal that is consumed within 5 minutes, is just crazy to me. I wonder when we will all just relax, eat what we want and give the Turkeys a year off. Definitely feel this salad is totally essential to balance with too much meat at the Xmas table. Hi Zoe! I feel the same way. Thanksgiving fare can sometimes be just too much food and all that preparation for something that is consumed in 5 minutes. Ahhhh! What a great salad – so healthy and delicious – glad to see Neal’s Yard cheese made an appearance! Hi Mary! So funny you recognized the cheese. I love that cheese. Hi Jackie – thinking a handful of pomegranates would be a perfect colorful topper! I’ll definitely try this, loved the other basic kale recipe, you’re turning me into a kale believer. Have you tried the “winter salad” at Blue Barn at the Town Center? So yummmy! Your photos are fab! Hi Andrea! Great idea! I actually added your pomegranate idea in the above post. I have yet to try Blue Barn, but we checked out the menu this weekend. That is my next lunch out for sure. I love that they serve Blue Bottle coffee. I think I will serve this up to the kids sans the squash and with the addition of the pomegranates and apples. 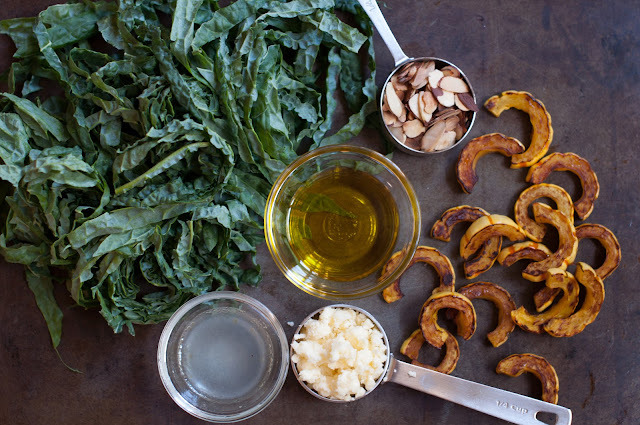 Your roasted delicata is perfect looking! And with the kale and cheddar and well, this trumps ‘holiday’ food any day! This is timeless! Wow, that photo is magazine quality. I can’t wait to try this salad! Awww Sally, you are so sweet! 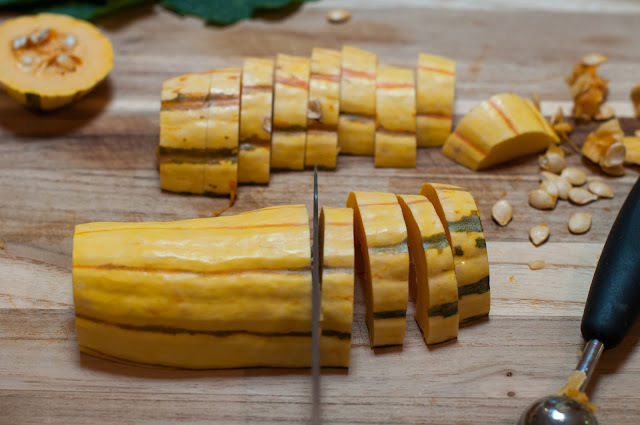 Ok I am not a squash fan but will try this with apples! What is the name of the cheese? Did I miss it in the post? The cheese didn’t really have a name, that’s why I took the photo. If you copy the words on the label then bring it to Whole Foods or Paradise, they will show you the cheese or at least give you something similar. Paradise might even have a clothbound Cabot Cheddar. You can always just ask one of the cheese guys for something similar to a clothbound cheddar, that’s how I found this one. I told him I was using it on a salad. Ok, let me know how it turns out for you Baker mama!